Ah, granola. I love it!. Give me some granola and milk, or some yogurt and fruit and I am SUPER happy. 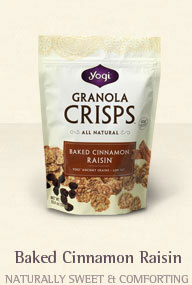 Yogi‘s Granola Crisps made without preservatives, artificial colors/flavors, high fructose corn syrup and GMOs. They also provide 20g of whole grains per serving (1/2 a cup). They come in 3 flavors, Baked Cinnamon Raisin, Fresh Strawberry Crunch, and Mountain Blueberry Flax. THESE ROCK!! They are bite-sized, about the size of a quarter, and resemble corn flakes a bit, but you can actually see oats and grains baked into each crisp. They have a nice crunch to them, and they are sweet! They have a sort of glaze on them which I think aids in the sweetness. This particular flavor you can taste the cinnamony goodness very easily, and you can also taste a nice light molasses flavor in the Baked Cinnamon Raisin flavor . (*added) The Fresh Strawberry Crunch was equally as delightful! Good strawberry flavor, and quite sweet! Just so tasty!